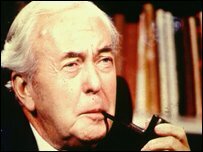 An analysis of former Prime Minister Harold Wilson's speech patterns suggests he may have had early Alzheimer's disease in office. A University of Southampton expert examined Wilson's changing use of language while at the dispatch box. The findings point to a possible decline in his mental function during his final months in office. Researcher Dr Peter Garrard suggests this may have contributed to Wilson's decision to resign in April 1976. The motives behind Wilson's resignation, which came as a surprise to most people, have long been a source of controversy. Dr Garrard, an expert in neurology, has previously demonstrated the presence of Alzheimer-like linguistic changes in the later writings of the distinguished novelist Dame Iris Murdoch. He analysed vocabulary trends in transcripts of Wilson's performance in the spontaneous cut and thrust of Prime Minister's question time throughout his two terms of office (1964-70, 1974-76). Dr Garrard said: "Language is known to be vulnerable to the earliest stages of Alzheimer's disease, and the findings of the earlier Iris Murdoch project confirmed that linguistic changes can appear even before the symptoms are recognised by either the patient or their closest associates. The study, published online in the Journal of Neurolinguistics, converted Hansard transcripts to digital format using optical character recognition software. This allowed Dr Garrard to use markers to compare Wilson's speech patterns, and the number of times he used certain words, with those of his parliamentary colleagues. The analysis was based on techniques developed by literary scholars for quantifying the stylistic similarities and differences between authors, genres, and literary eras. The findings showed that the content of Wilson's speeches was identifiably different from those of other members of the House throughout his career as prime minister. However, the difference was smaller during the months leading up to his resignation - a sign that he was losing his distinctive voice. Dr Garrard said that could be a sign of the earliest stages of Alzheimer's. However, he admitted that other factors may explain the change - for instance, loss of motivation for the job. Rebecca Wood, of the Alzheimer's Research Trust, said: "That such a politician, despite his hectic schedule and renowned intellect, could develop Alzheimer's suggests that no-one is immune from the disease. "Margaret Thatcher developed dementia after leaving office, and many presidential historians believe Ronald Reagan's Alzheimer's was already present during his second term. "Both figures have had an enormous impact on public awareness of a condition that is too often swept under the carpet." Dr Garrard has secured funding to collect and examine a large database of spoken and written language samples as part of a project to investigate the impact of ageing on memory. Professor Clive Ballard, of the Alzheimer's Society, said: 'Linguistic techniques could be useful for assessing communications problems in people with dementia. "For instance, examining a person's diary could give valuable insight into how a person's communication skills have changed over time and help with diagnosis."